If you are interested in coming to the Truman State University campus for an on-campus visit or informational session, please contact the Career Center for assistance in arranging meetings or presentations with appropriate faculty and student groups to discuss your organization and hiring needs. We can reserve interview rooms for you and help you fill interview slots using our online job posting and interview scheduling software, #HireTruman. When entering Kirksville from the south or north on Highway 63, take the Baltimore Street exit (Business 63). Turn west (left) on Patterson Street. Turn north (right) on Franklin Street. The Student Union Building is located on the east side of Franklin Street. If you reach Normal Street, you have gone too far. Parking lots are located on both the north and south sides of the Student Union Building on Franklin Street. When you check in with the Career Center on the 3rd floor of the Student Union Building (room 3100), we will provide you with a hangtag which will allow you to park in any lot. If you would like your hangtag sent to you beforehand, please contact us at least 10 days in advance. 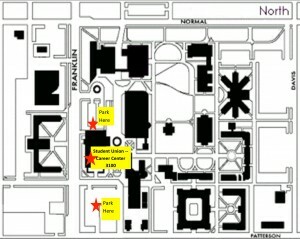 The parking lot on the north side of the SUB has designated visitor parking spots, but you will still need a hangtag to avoid getting a ticket. The hangtag allows you to park in any lot. If your interview schedule includes a break for lunch, complimentary meal vouchers will be provided for lunch in Mainstreet Market on the main level of the Student Union Building, which offers food-court style dining options. Coffee, snacks, and other food items are available throughout the day at Mainstreet Market as well as Jazzman’s Cafe (a coffee specialty shop) and Zime (a mini bistro) which are also located on the main concourse of the Student Union Building. Starbucks is located on the first floor in Pickler Memorial Library.